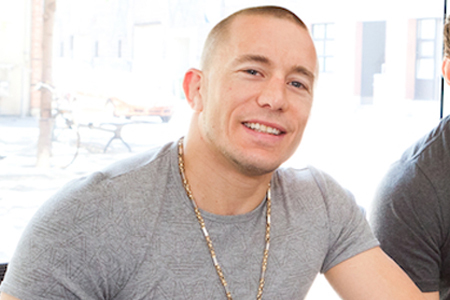 Because Georges St-Pierre (Pictured) hasn’t been seen inside the Octagon since UFC 129, many keyboard warriors have forgotten about his dominant 22-2 résumé and written off the reigning welterweight king. While his surgically-repaired knee continues to mend, it appears GSP has been reading the blogs and convinced himself that he is no longer the division’s top dog. “The way I see it, I am not the champion anymore on Saturday night,” St-Pierre told the UFC. “I have not fought since April, against my will, but I understand the champion must fight. You have to put the belt on the line in order to call yourself champion, the best in the world. Right now I am not the best in the world, I am injured. Nick Diaz and Carlos Condit battle for the interim 170-pound crown this weekend at UFC 143. St-Pierre claims he won’t be able to start fully training until July, so there’s a possibility Diaz or Condit may have to take another fight before unifying the title against St-Pierre. However, “Rush” is hoping the UFC waits out his return and allows the champion vs. champion shootout so things can be settled once and for all.